Ekstremt privat 2 soverom og 2 bad leilighet på vakre Lake Christopher. Det er et privat takdekk med grill. Leiligheten har et komplett kjøkken, master-sengs rom og en hems. Det er et komfortabelt oppholdsrom med vedovn. Flott for familier som leter etter en svært rimelig ferie. 20 minutter til Sunday River og 10 minutter til Mt Abram. Downtown Bethel ligger 10 minutter unna, og har mange restauranter og butikker. Nyt svømming, fiske og båtliv i sjøen. Did a mens ski trip February 2019 and it was awesome! The condo was very nice. Great view of the pond which was frozen with ice fishing huts on it. Very convenient to sunday river, about 20 minutes. There was an ongoing joke of the chimney in the middle of the living room, we thought that was a pretty funny spot for a chimney. One other thing it was tough to get to the garbage the last day because there literally was 4 inches of water to go through to get to the trash. Besides that it was great!! We loved waking up to the beautiful lake view and watching the leaves change on the hills. Having the canoe allowed us to paddle across the pond and hike up Mount Christopher. The view from the top was spectacular. We will definitely plan a return trip. Me and wife loved the upper deck of condo, great view of lake. We basically had the whole complex to yourself, so it was nice and quiet and very peaceful the whole weekend. We stayed here for several nights at the end of August with our 2 year old. We loved the view of the lake from the roof deck, and the privilege of being able to use the canoe. It is such a wonderful way to relax and spend time in Maine. The condo is 2 floors and has 2 full bathrooms. It was very clean when we arrived. The air conditioner worked great, thanks goodness because it was an Indian summer when we arrived. There were several toys and board games throughout the condo. A couple of things one should know in advance: linens and towels are not provided so bring your own, the condo has a great view which means you must walk up stairs to get in, and there is one convenience store in town plus a small natural foods market 10 mins up the road and a grocery store in bethel 20 mins up the road. The train comes by once around 10pm and shakes the house but isnt a big deal. We thought it was kind of cool. We will definitely be staying here again when we come through to visit family. 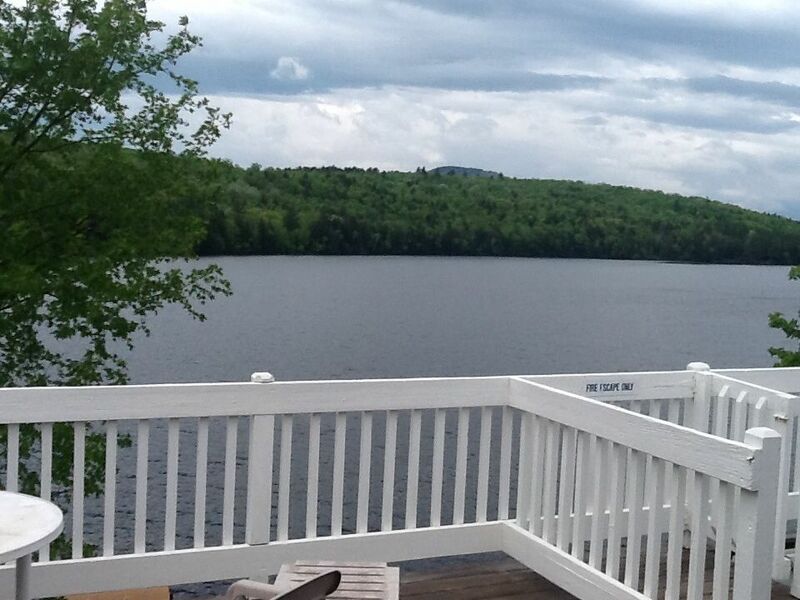 The price is reasonable, the owners are wonderful communicators and nice people, and the lake is beautiful. I’m really happy we found it. We had a very relaxing vacation. The condo was quiet and the train did not bother us at all.